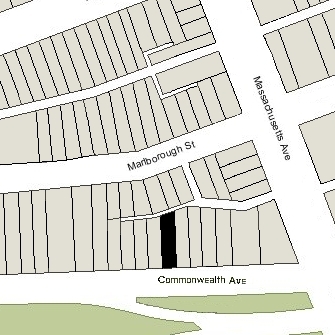 383 Commonwealth is located on the north side of Commonwealth, between Massachusetts Avenue and Charlesgate East, with 381 Commonwealth to the east and 385 Commonwealth to the west. 383 Commonwealth was designed by architect Obed F. Smith and built in 1885-1886 by Charles H. Dodge, mason, for building contractor George Wheatland, Jr., for speculative sale, one of six contiguous houses (381-383-385-387-389-391 Commonwealth). George Wheatland, Jr., is shown as the owner on the original building permit application for 381 Commonwealth, dated December 15, 1885. 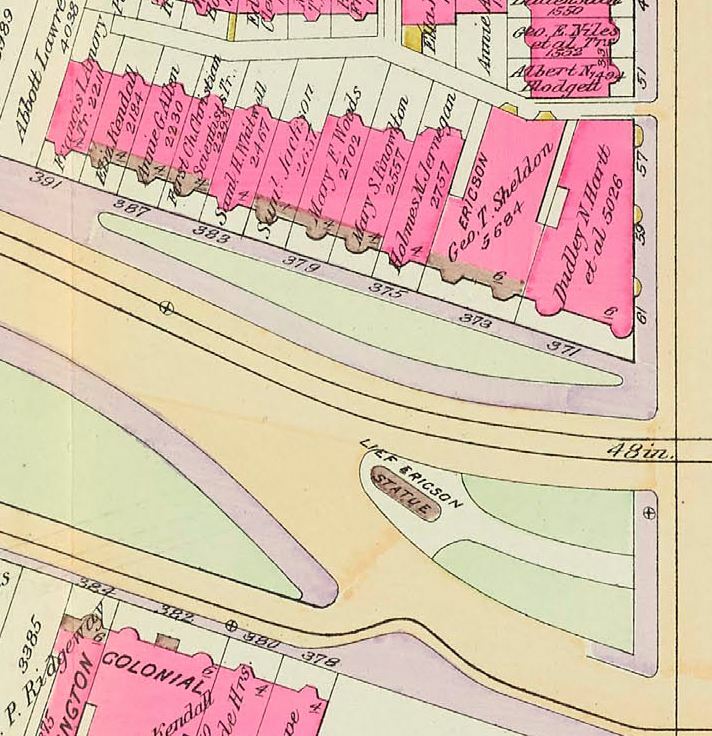 At the same time, George Wheatland, Jr., was having six more houses built at 430-440 Marlborough, on the lots to the north, behind 381-391 Commonwealth, also designed by Obed Smith and built by Charles Dodge. 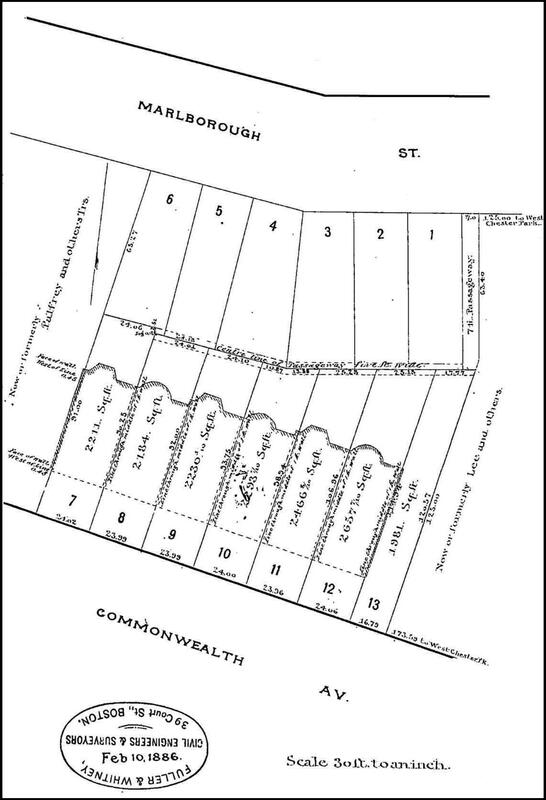 Click here for an index to the deeds for 383 Commonwealth, and click here for further information on the land west of Massachusetts Avenue between the south side of Beacon and the north side of Commonwealth. On December 12, 1888, 383 Commonwealth was purchased from George Wheatland, Jr., by real estate dealer Samuel Horatio Whitwell. He was unmarried and lived at 111 Commonwealth with his brother and partner, Henry Whitwell, and their sister, Sophia Louisa Whitwell. By the 1889-1890 winter season, 383 Commonwealth was the home of brick manufacturer John Henry Hubbell and his wife, Sarah Marietta (Dana) Hubbell. They previously had lived at 283 Commonwealth. Sarah Marietta Hubbell’s sister, Caroline Winchester Dana, lived with them. They continued to live at 383 Commonwealth during the 1893-1894 winter season, but moved thereafter, probably to Coal Run, Ohio, where Sarah Marietta Hubbell died in September of 1894 (she and her sister were born Waterford, Ohio). Henry Hubbell died in October of 1895 at the Hotel Vendöme. During the 1894-1895 winter season, 383 Commonwealth was the home of Eben Wright and his wife, Leta (Pell) Wright. Their usual residence was in New York City. He was a collector and expert on Medieval tapestries, carvings, and art, and had just lent the Museum of Fine Arts five Flemish tapestries for display. 383 Commonwealth (ca. 1896). detail from photograph of 383-387 Commonwealth; © The Mary Baker Eddy Collection; used with permission. By the 1895-1896 winter season, 383 Commonwealth was the home of Miss Carrie Thirza Fitch. She previously had lived at 34 Fairfield. She initially leased the house from Samuel H. Whitwell and then, on July 23, 1900, it was purchased from him by a trust established under the will of her father, Jonas Fitch. During the 1907-1908 winter season, she was living elsewhere and 383 Commonwealth was the home of wholesale cotton merchant John Silsbee Lawrence and his wife, Emma (Atherton) Silsbee. They had married in April of 1907 and 383 Commonwealth probably was their first home together. Prior to their marriage, he had lived at 140 Beacon. 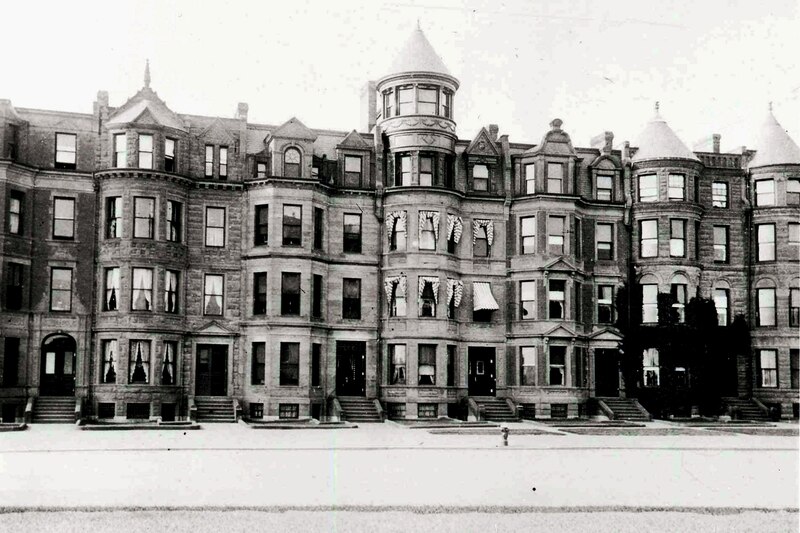 By the 1908-1909 season, the were living at the Lenox Hotel at 61 Exeter. 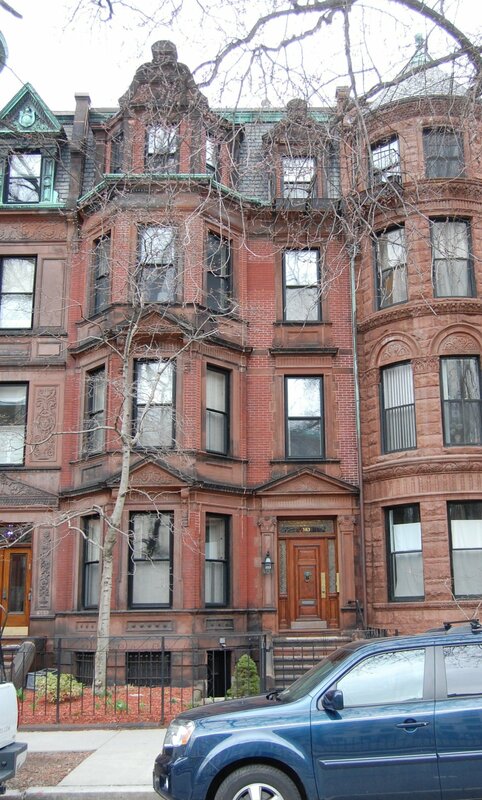 By the 1908-1909 winter season, Carrie Fitch had resumed living at 383 Commonwealth. 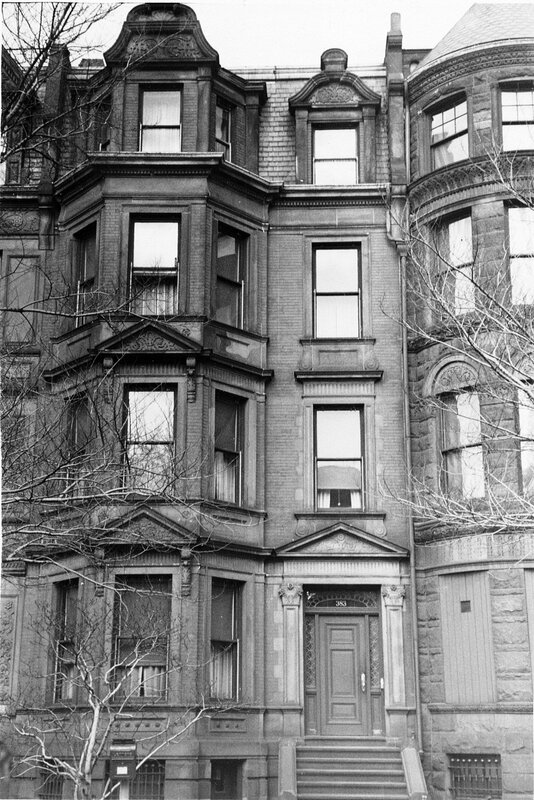 She continued to live there during the 1918-1919 season, but moved thereafter to The Charlesgate at 535 Beacon. 383 Commonwealth was not listed in the 1920 and 1921 Blue Books. By 1920, 383 Commonwealth was the home of Anna K. (Brigham) Hall, widow of leather merchant Henry Lyon Hall, and their four children: Henry Lyon Hall, Jr., Anna Brigham Hall, Frank B. Hall, and Mary C. Hall. Prior to her husband’s death in June of 1917, they had lived in Dorchester. Henry L. Hall, Jr., a leather salesman, married in 1924 to Edith Page Blanchard. After their marriage, they lived in Newton. Anna Brigham Hall married in March of 1929 to John Sewall Hooper. After their marriage, they lived in Brookline, where he died in December of 1929. At the time of the 1930 US Census, Anna Hooper and their infant daughter, Dorothy, were living at 383 Commonwealth with her mother and unmarried siblings. 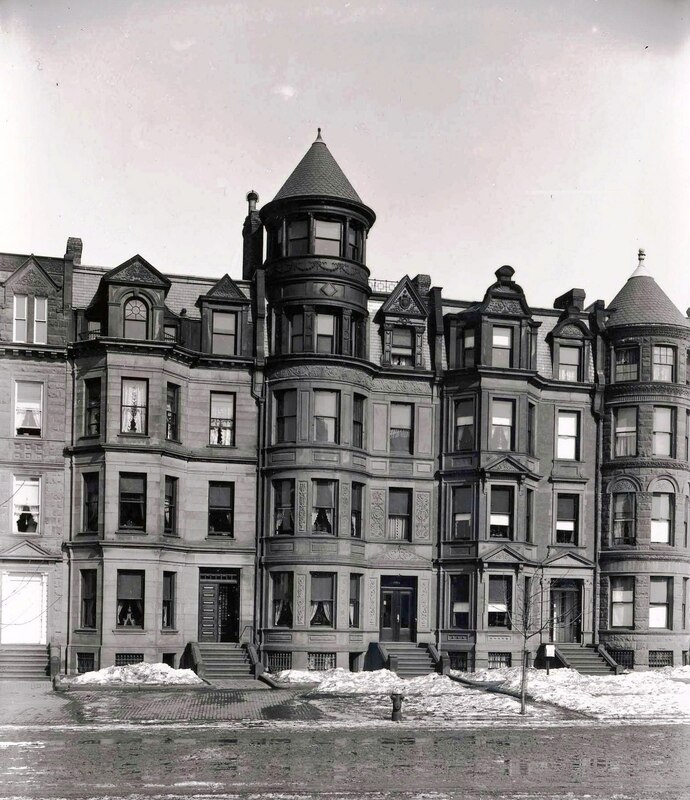 Anna Hall, Frank and Mary Hall, and Anna and Dorothy Hooper continued to live at 383 Commonwealth during the 1930-1931 winter season, but moved thereafter to Hingham. 383 Commonwealth was not listed in the 1932-1937 Blue Books. By 1932, it was the home of Stephen J. Flynn and his wife, Elizabeth G. (Sweeney) Flynn, who operated it as a lodging house. They previously had lived in Lowell, where he had served as City Clerk until 1931. They continued to live at 383 Commonwealth and to operate it as a lodging house until the late 1930s. By 1940, they were living at 350 Beacon. 383 Commonwealth was shown as vacant in the 1940 City Directory. On July 19, 1938, 383 Commonwealth was acquired from the trust created under Jonas Fitch’s will by Charles E. Lord, George L. Sleeper, and Benjamin H. Leighton, trustees of the Shawmut Realty Trust, established to acquire and manage property for the benefit of the First Church of Christ, Scientist, in Boston. The Church also owned 385 Commonwealth, which had been the home of its founder, Mary Baker Eddy, and 387 Commonwealth. 385 Commonwealth was a single-family dwelling, the residence of the Church’s First Reader; 387 Commonwealth was a lodging house. 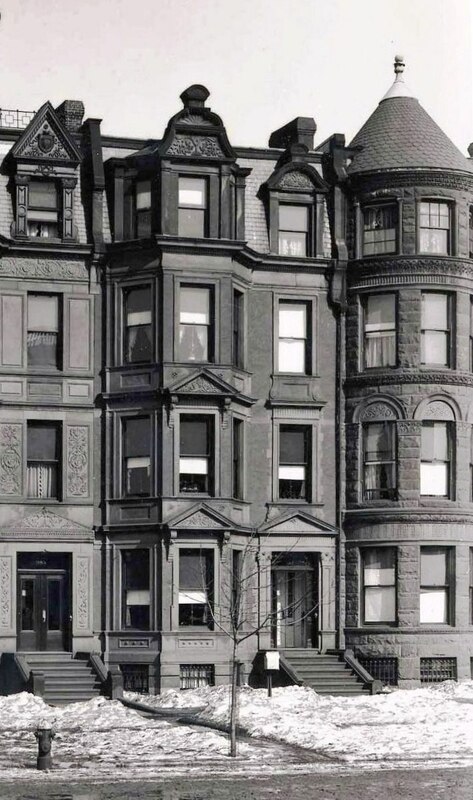 In April of 1942, the Christian Science Church applied for (and subsequently received) permission to convert 383 Commonwealth from a single-family dwelling into a lodging house, legalizing its prior use. Both 383 and 387 Commonwealth remained lodging houses, with various operators and owned by the Church, for the next forty-five years. 385 Commonwealth remained the residence of the Church’s First Reader. On May 2, 1946, the trustees of the Shawmut Realty Trust transferred 383 Commonwealth and 387 Commonwealth to themselves as trustees of the Church Realty Trust, a new trust created for the benefit of the church. By 1942, the lodging house at 383 Commonwealth was operated by Mrs. Mildred Eaton (Thompson) Hadley, the former wife of Waldo Snow Hadley. She lived at 506 Beacon, where she also operated a lodging house. She continued to operate the lodging house at 383 Commonwealth until about 1954. By 1954, 383 Commonwealth was the home of Miss Jessie E. Gardner, who operated it as a lodging house. She previously had lived at 176 Huntington. She continued to live (and operate the lodging house) at 383 Commonwealth until about 1964. In October of 1987, the Church Realty Trust applied for (and subsequently received) permission to convert 383 Commonwealth into seven apartments, and in May of 1991, it applied for (and subsequently received) permission to reduce the number of apartments to five. In December of 2017, the trust received approval to increase the number of apartments from five to six by building a new unit in the basement. 383 Commonwealth remained an apartment building in 2018.